So, in my habit of fixing sh*t no one seems to notice i came across a good fix. Have you noticed that. 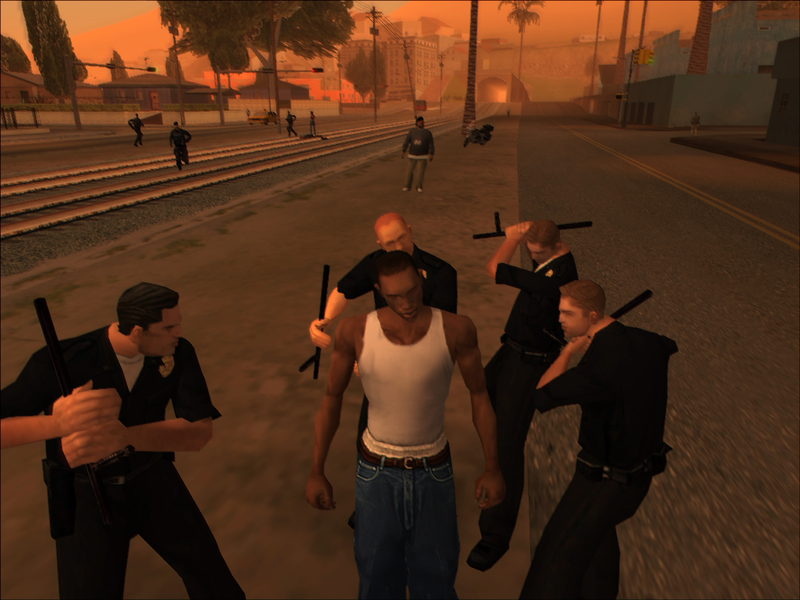 when you have only a one star wanted level and a few cops arrive, only one of them fights you? even the bike cop arrives and they just start walking away casually like you are not fighting one of them right there. In case you are the type to start BLASTING fools before even trying to square up, here, see for yourself. 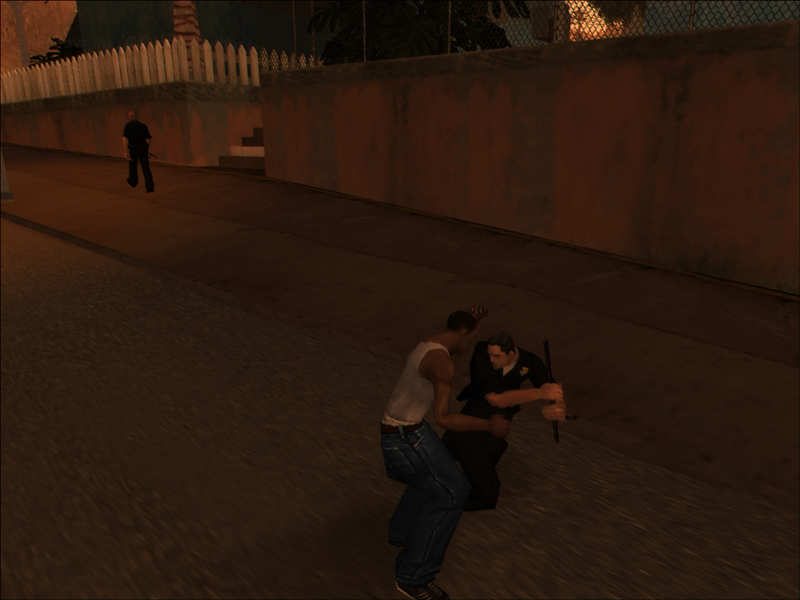 So, since i like a little of POLICE BRUTALITY myself, i fixed this, because, ilike fighting, and ilike fighting cops, so, here, this is what will happen now. NOW you have a reason to start blasting. Just one more time: a better late than never fix! You are using 0AE1: in the wrong way, you need to use "find_next 0" first to get the first ped on pool, so you use "find_next 1" to get the next one, otherwise your mod may have problems catching peds, especially if other mods also use this command. You said this to me before, but i don't quite understand yet, that problems what may bring, can you explain to me better? When you use "find_next 0" the mod will notify the CLEO Library that you are initiating the pedestrian list (or cars), so the search will be reset to the first pedestrian of the game list, and when using "find_next 1" will go to the next one etc. If you are not telling CLEO to return to the first ped, it will return the current last one, for example the last one that another mod got. Try to understand the basics but you don't need to understand exactly, just use the code I sent you and will be all fine. Otherwise at some point you will go through headaches and people reporting that your mod is not working or not all the peds are affected. This command is dangerous, even more so if you use "wait" inside the loop. This pedestrian list is shared with all cleo scripts, if another is using at the same time as you, when the script finds a "wait" and the game processes other scripts, and this script also uses "wait", the scripts will share the same list at same time. If both were "wait 0", your script will take one ped, the other will take another, so both scripts will control half the peds and not know that the other half exists. If your mod is working, it's luck, it can cause conflicts with other mods also wrong. Worth to merge this in SilentPatch ? No, let's leave silent alone, he's had enough requests for a lifetime. Worth to merge this in MixSets? I guess it's just really hard to install 2 mods seperately? All-In-One mod was pretty good. Bring back spaceeinstein! Well, even when star is gone, still the police comes near you and beat you and it's a nightmare during missions. When even the car color is changed the cop still comes to beat you. Well, even when staris gone, still the police comes near you and beat you and it's a nightmare during missions.